The staircase seems so steep. Never ending. And right now, the destination is unknown. Too cute!! I love capturing these types of moments too! Is that Amara? 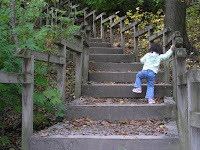 Wow..so small but look at her take on those steps with such determination. What an adorable picture! Is that in one of the Metroparks? Jen - yes, it's Amara when she was just a toddler! Tesa - it's just outside the French Creek Nature Center in Sheffield...not too far from you!